With all of our modern knowledge, email filters, and warnings about opening attachments from unknown addresses, how big of a deal can spam really be these days? Unfortunately, email spam is still very much a problem in 2018 – especially for the many businesses who fall victim to spam and phishing scams year after year. Not only can email spam can hurt your productivity and result in security breaches, but it can also land you a hefty fine if you accidentally send it to your contacts. 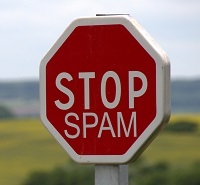 As of the most recently reported period, spam messages accounted for 48.16 per cent of e-mail traffic worldwide. In 2016, the United States accounted for the majority of unsolicited spam e-mails with 12.08 per cent of global spam volume. The most common types of spam e-mail were healthcare and dating spam. Contact Form 7 Manual Spam Blocker is an easy-to-use plugin to block all those spammers who manually fill out forms on your website. It provides with an extra tab on each Contact Form 7 (CF7) edit screen where you can set block conditions for each input field in the form. Spammer usually can be identified with the continuous, unwanted contact form submission on your website who include some sort of marketing text in their message, e-mail is usually from the same domain. Each time you find a new spammer irritating you, just add another line in the block settings and show them a harsh spam message. Step 1: Edit any CF7 form and click on the Block Spam tab. Step 2: Choose a condition to block the manual spammers “Value Equals to” or “Value Contains” for each input field. Step 3: Enter the message to be shown to the spammer. You may want to abuse the bloody ones! Step 4: Enter the input values to be blocked, one entry per line and just Save it. We have allowed spam blocking on text, email, text area, URL and tel fields of Contact Form 7 (CF7). For the sake of ease, few field types (select, checkbox, radio, captcha, number) are not enabled. How to block big message in text area input? To block SPAMMING in text area field you should choose blocking condition “Value Contains” and use a small and important phrase from the SPAM message you receive.